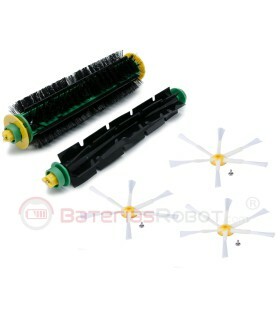 Pack 3 Lateral brush with 6 blade arms for Roomba 500 600 and 700 series (Compatible iRobot). 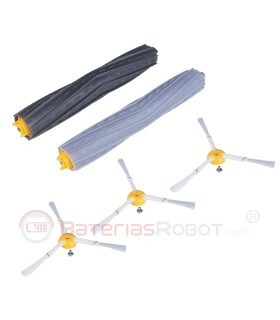 Composed by 6 arms (blades) with polyamide bristles, ultraresistant to abrasion. A 100% compatible with all models from the 500, 600 & 700 Roomba series. 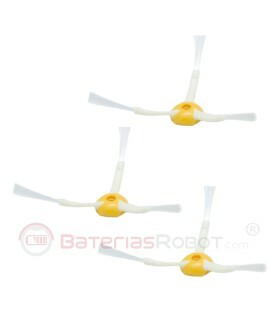 Registered product by BateríasRobot trademark. Pack toothbrushes bristles and Flexible compatible Roomba series 500 iRobot. Manufactured in polyamide bristle brush + flexible brush + 3 side brushes. More abrasion resistance than the original brushes . 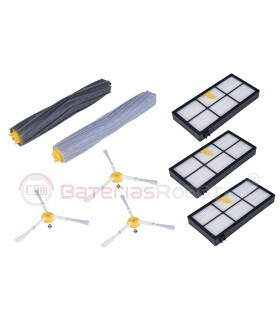 100% compatible with all models of Roomba 500 . registered Robot batteries branded product®. Pack toothbrushes bristles and Flexible compatible Roomba series 500 of iRobot. Manufactured in polyamide bristle brush + flexible brush. More abrasion resistance than the original brushes. 100% compatible with all models of Roomba 500. Product trademark batteries Robot®. 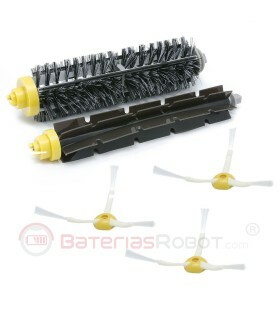 Kit 3 Lateral brush for Roomba 500, 600 & 700 series. Formed by three arms (blades) with polyamide bristles, ultraresistant to abrasion. 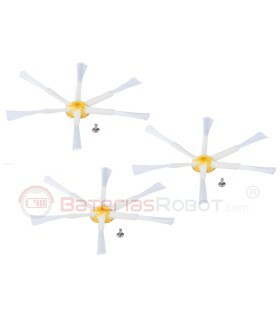 A 100% compatible with all models from Roomba 500, 600 & 700 series. 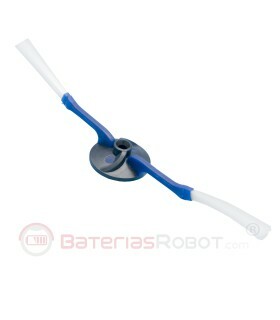 Registered product by BateríasRobot trademark. Pack toothbrushes bristles and Flexible compatible Roomba series 600 and 700 of iRobot. Manufactured in polyamide bristle brush + flexible brush + 3 side brushes. More abrasion resistance than the original brushes . 100% compatible with all Roomba 600 and 700 models. Registered Robot batteries branded product®. 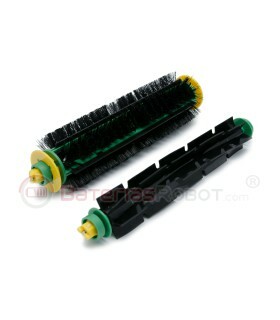 Pack bristle brushes, Flexible and 3 side brushes 6 blades compatible Roomba series 600 and 700 of iRobot. 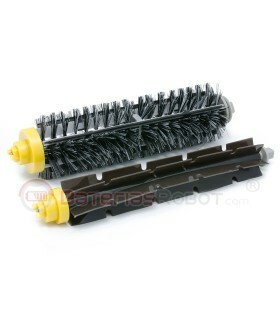 Manufactured in polyamide bristle brush + flexible brush + 3 side brushes 6 blades. More abrasion resistance than the original brushes. 100% compatible with all Roomba 600 and 700 models. Product trademark batteries Robot®. 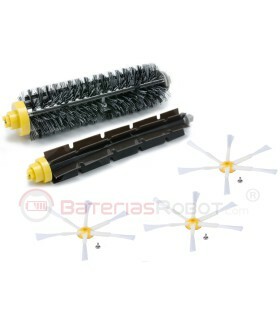 Pack brushes of hairs and Flexible compatible Roomba series 600 and 700 of iRobot. Hair brush made of polyamide + flexible brush. More abrasion resistance than the original brushes. 100% compatible with all Roomba 600 and 700 models. Product trademark batteries Robot®. Pack of spare parts including 3 side brushes, 2 roller extractors AeroForce and three filters EPA. All compatible with Roomba series 800 and 900 of iRobot. More abrasion resistance than the original brushes . 100% compatible with all Roomba 800 and 900 models. EPA filters anti mite. Registered Robot batteries branded product®. 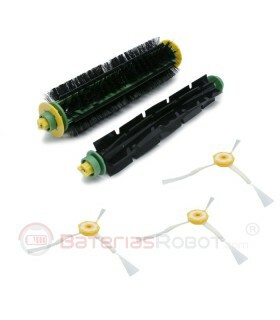 Pack of 3 side brushes and rollers 2 extractors AeroForce compatible with Roomba series 800 and 900 of iRobot. More abrasion resistance than the original brushes . 100% compatible with all Roomba 800 and 900 models. Registered Robot batteries branded product®. Pack tools cleaning Roomba iRobot. 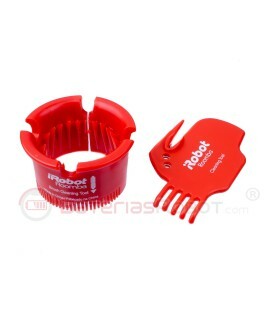 1 tool to remove hairs and dirt from the bristles of your Roomba brush. 1 tool provided with blades for cutting hair and threads that may be entangled by the wheels and brushes.